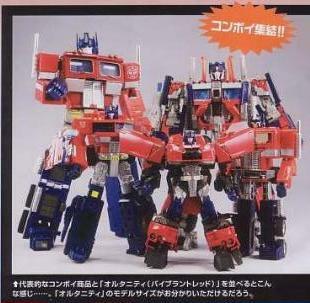 The current issue of Hobby Japan magazine has new images of several upcoming Transformers items from TakaraTomy. New images of the MP-08 Masterpiece Grimlock prototype are shown, including the first ever size comparison image with the original Generation One Grimlock figure. Also shown in the scans are control art for Alternity Megatron as well as a size comparison of the Alternity Convoy figure with other Convoy/Optimus Primes figures. Check out all of the new scans by clicking on the image to the left. Ok, I can believe his dino mode is ~ 9.5". Why do you think it gets shorter in robot mode though? In dino mode the dino leg doesn't even measure up to half the height of the figure. In bot mode the dino leg (now robot arm) is more than half the height of the figure. 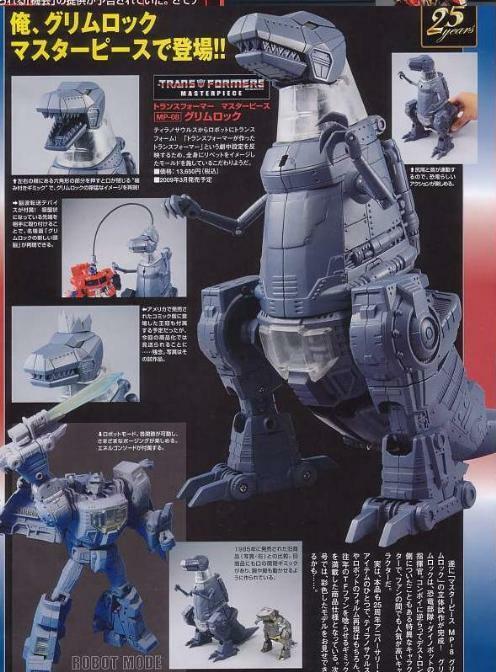 The proportionality of that one part, which does not change much (if at all) in size during the transformation shows that the bot must be smaller than the dino. I think it gets shorter in robot mode based on trying to measure parts in the photo common between the two modes (like the chest chunk). The main thing that seems to make Dino mode taller is the upper body and head (that form backpack and wings in robot mode) are longer/taller proportionally than the were on the G1 Grimlock toy. Also this toy stands up straighter in dino mode than G1. The height of the dino mode can probably vary a lot, depending on how you position the legs and slant the body. It's possible it was designed that way intentionally, as in the cartoon Grimlock was (usually) shown somewhat bigger in dino mode than in robot mode. I could be wrong though – won't know for certain until I have one or see some more obvious comparison pics. And, I could have it wrong, but as I see it, his bot mode will be at the tallest, equal to dino mode, and most likely shorter by 1-.5 inches. All in all, he will not be "in scale" in bot mode to a 12" Prime. If he is shorter than MP Prime, then he should look perfect towering over the rest of the bots on my Classics shelf. You're welcome, though I'm not sure you read what I wrote. The 9" line I put in there is representative of what G1 Grimlock's height is doubled. MP Grimlock appears to be a little over double G1 Grimlock's height, which would put him at 10-11" tall, which is taller than MP Starscream's 8.5" height. Given that his transformation will probably give a little extra height, he should be MP Prime's height in bot mode. Let me add that this all just my own assumptions and I don't claim it's proof positive of anything. I think the dino mode will come in at 9.5 tops, which corresponds with the original poster description. You mean the thing that is connecting Grimlock's head to Prime's head? If so that is the brain transfer thing seen in the episode where Grimlock gives the Technobots the smarts he got earlier. I think he'll have it in the end. They probably just don't have it ready to show off yet. Or they're saving it for when we finally get to see a colored version of him, or something along those lines. for that kind of attention to detail, sheesh, it is a must have on anyone's list. MP Grimlock, just awesome. Height doesn't bother me in the slightest, articulation and complexity are the important qualities in an MP, and so far the signs are good. Bit of a shame about the light up hand gimmick, i'd much rather he has an articulated right hand – but hopefully it won't be tricky to mod that. And as it is, if Grimmy's dino mode is about Seeker robot height, i'm sure his 'bot mode will gain some height on that; so he's hardly a dwarf. Preodered him the other week, along with Alternity Megs, so now it's just saving up til next March.. always good to have a Masterpiece TF to look forward to. MP Grimlock looks like his dino mode is a little over twice as tall as G1 Grimlock, which would put his dino-mode at 10 or 11" tall. MP Starscream is ~ 8.5" at the top of his head, so he should be taller than MP Starscream. THANK YOU FOR A REAL SIZE COMPARISON!!! I'm so sick of morons claiming MP Grim is going to be taller or "massier" than MP Prime, trying to justify the price. Here it is folks, proof positive. It's going to be roughly the same size as MP SS! Great new pics. It's still hard to tell, but it looks as though he'll be the perfect size for my Classics Autobots. It wouldn't surprise me if his dino-mode ends up being taller than his bot-mode. Well, that's the way it was (supposed to be) in the G1 cartoon, according to the size-comparison model sheets. I got out some of the toys shown in the magazine page to get a better idea of MP Grimlock's size. I just wish there were some comparisons which used Grim in robot mode. Anyway, I came to some (admittedly rough) conclusions. * MP Grimlock in upright dino mode is taller than MP Starscream. * My guess is MP Grimlock's robot mode is of similar height to MP Starscream, (confirming earlier info) maybe a bit taller at the head, and more massive overall. Yeah, I'll be getting this thing. what is that tube that i see in the one inset picture on the left for? i don't get that one or am i looking at it wrong? 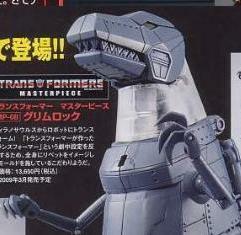 aside from $$$$, i kinda like this Grimlock. im just wondering if grimmy still has his gun or not..
MP Grimlock is AWESOME, everytime new pics are reveled i like him even more, now knowing how HUGE his dino mode is next to G1 Grimlock it makes me like him that much better, I was really excited about alternity Prime until i saw these pics, hes really small, but it also makes him more interesting knowing how complicated his transformation looks, and as for fairlady megs, I need to see more pics, those half body sketchs arent gonna do it for me, but everything else is awesome, Takara Tomy is going for Gold next year. Looks really nice and got some mass there!